I’m switching gears a bit on my high school movie binge this May to revisit a classic high school film, and by classic I mean pre-John Hughes. 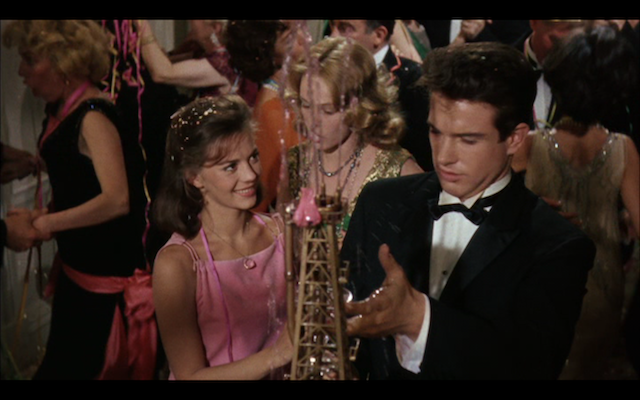 Splendor in the Grass (DVD/Download) was released in 1961 and stars Natalie Wood and Warren Beatty (in his first feature film role) as two star-crossed Kansas teenage lovers. Though I’m of course a big fan of classic cinema, this film has always felt timeless to me. It captures teen angst in such a pure way- ie. that feeling of every little problem being a life or death situation, the intensity of emotions, and inability to wait for the future to happen. On the surface it’s a high school movie about “going all the way”, but really it’s about the passion of youth and the remembrance of things past. Splendor in the Grass tells the tale of Bud Stamper and Deanie Loomis, two teenagers in rural Kansas. He’s a rich boy who wants to shirk the family oil business in favor of becoming a farmer, and she’s the daughter of a humble shopkeeper. When the movie begins, it’s clear that Bud and Deanie are the most popular couple in school, and genuinely in love. However, soon teenage lust rears its ugly head, and Bud can’t reconcile his passionate yearnings with the “good girl” on his arm. There is a betrayal, and Deanie is driven mad with grief. The film is set against the background of the Roaring 20’s, and it’s fun to see Bud’s flapper sister come to town to shake up the family. Deanie’s clueless mother also deserves special mention, since her cure-all for mental illness seems to be a big plate of mystery meat and gravy. As the Fresh Prince so wisely said, “Parents just don’t understand.” The beautiful Natalie Wood does an amazing job of becoming unhinged, and it’s easy to see why Warren Beatty was a heartthrob in his day- Yowza! Sorry, but he puts pretty much any teen idol of recent years to shame. My drink this week is inspired by the Wordsworth poem that is recited during the film- “Though nothing can bring back the hour of splendor in the grass, glory in the flower, we will grieve not; rather find strength in what remains behind.” This drink references floral notes and farm life in Kansas, and I’m using an exciting new beverage I found at my local store called Tekeen. This is a pre-mixed alcoholic drink, but of course I like to fancy it up with a little St. Germain. When watching Splendor in the Grass, I recommend drinking a glass of Mabel’s Merriment. Build ingredients over ice in a tall Collins glass. Garnish with fresh key lime slices. I think everyone can relate to the feeling that what is happening in high school is so tragically important at the time, and this film shows that the bonds formed during that period are never really forgotten. Perhaps that’s why I love high school movies so much, for they are the films I watched over and over again as a teenager, as I was just beginning to shape my identity. In many ways I feel a closer bond with the characters in these films than I do to my actual classmates from that time. Watching this movie again (still on the VHS tape I bought in high school!) certainly makes me feel like I attended a reunion of sorts. It’s no secret I hated high school, but I absolutely loved that time in my life when I was discovering cinema, and watching anything and everything I could get my hands on. I miss those days, when every script and style and actor was new to me, but I will grieve not- rather find strength in the great films that remain behind. Cheers! Posted in Classic Films and tagged cocktail recipe, high school movie, Natalie Wood, Splendor in the Grass, St. Germain cocktail, Tekeen, Warren Beatty, Wordsworth poem. Bookmark the permalink.